Caudal block is the most frequently used regional anesthetic technique for pediatric analgesia, with the disadvantage of limited duration of action. Transversus abdominis plane (TAP) block has been reported to provide effective analgesia after lower abdominal surgery, but there are few data comparing caudal block with ultrasound-guided TAP block in pediatric patients undergoing surgical pyeloplasty. Thirty-nine patients (6 months to 6 years) scheduled for elective surgical pyeloplasty were divided into two groups in a double-blinded randomized manner. 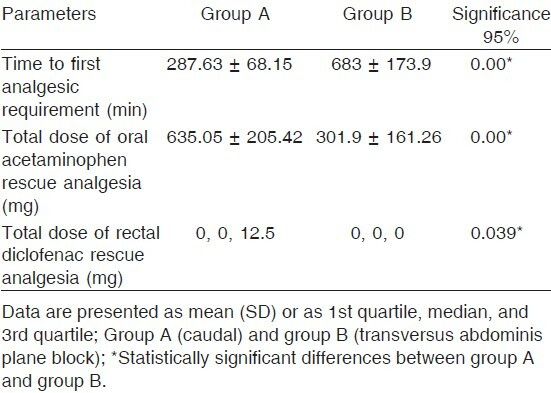 After sevoflurane in oxygen anesthesia, patients were assigned to one of the two groups: group A (caudal; n = 19 patients) received a single caudal dose of isobaric bupivacaine 0.25% (1.25 ml/kg) and group B (TAP block; n = 20 patients) received isobaric bupivacaine 0.25% (0.3 ml/kg). The primary outcomes were the time to first analgesia in minutes and the analgesic doses (oral acetaminophen and rectal diclofenac) required during the first 24 h postoperatively. The secondary outcome measures included FLACC pain scale score and intraoperative hemodynamic variables. Group B had a significantly longer time to first analgesia (602, 705, 748 vs. 250, 280, 365 min) and required significantly lower doses of acetaminophen (301.9 ± 161.26 vs. 635.05 ± 205.42) and rectal diclofenac (0, 0, 0 vs. 0, 0, 12.5 mg) than group A. FLACC pain scale score was significantly lower in group B than in group A (P < 0.05) at 2, 4, 6, 8, 10, 12, 16, 18, 20, and 24 h postoperatively. There was no significant difference between both groups with respect to intraoperative hemodynamic variables. Unilateral TAP block provided superior analgesia compared with single caudal block injection in the first 24 postoperative hours after surgical pyeloplasty in infants and children aged 6 months to 6 years. Ureteropelvic junction obstruction is one of the most common causes of hydronephrosis in pediatric age group. Open pyeloplasty has traditionally been used to treat those patients . Although general anesthesia is the commonly used technique in children, regional anesthesia is used as an adjuvant for intraoperative and postoperative pain relief . Caudal epidural block is one of the most safe and popular techniques in pediatric analgesia for infraumbilical and supraumbilical surgical procedures. The main disadvantage of caudal analgesia is the limited duration of action after a single injection . Several studies demonstrated that transversus abdominis plane (TAP) block is easily performed under ultrasound guidance and has been described as an effective technique to reduce postoperative pain and morphine consumption after abdominal surgery ,,. The efficacy of the TAP block in providing postoperative analgesia and decreasing analgesic requirements for 24 h has been shown in adults ,. We planned this randomized, prospective, double-blind study to compare the analgesic efficacy of TAP block as against caudal block in infants and children undergoing surgical pyeloplasty. This prospective randomized double-blind study was carried out during the period from April 2010 to April 2012 in Ain Shams University Hospital, Cairo, Egypt. After local ethical committee approval and written informed consent from parents, 40 ASA status I or II patients, aged 6 months to 6 years scheduled for surgical pyeloplasty, were enrolled in this prospective, randomized, and double-blind study and were divided into one of the two groups: group A (caudal; n = 20 patients) and group B (TAP block; n = 20) using computerized program. Study exclusion criteria included a history of developmental delay or mental retardation, which could make observational pain intensity assessment difficult, hypersensitivity to any local anesthetics, bleeding diathesis, and any signs of infection at the puncture site of the proposed block. All patients in this study were anesthetized by the same team of anesthesiologist and surgeons who were unaware of the study medications. All medications were prepared by pharmacy staff not participating in the study. After obtaining patients weight, the volume to be injected in the caudal block and TAP block was prepared in syringes with labels indicating only the serial number of the patients. All patients were premedicated with midazolam 0.4 mg/kg orally for 15-20 min before anesthetic induction. Patients were monitored using standard monitoring (heart rate, noninvasive blood pressure, and pulse oximetry). Heart rate and mean arterial blood pressure were recorded before induction of anesthesia and every 5 min until the end of surgery. All patients were given general anesthesia using 8% sevoflurane in 50% air and 50% O 2 through Jackson-Rees modification of Ayre's T piece with appropriate-size face mask. During induction of anesthesia, a 22-or 24-G intravenous cannula was inserted on the dorsum of the hand. After intravenous access was secured, endotracheal intubation with appropriate size to the patient's age and fixed in place was performed after administration of 0.5 mg/kg of atracurium, and controlled mechanical ventilation was used to maintain end-tidal carbon dioxide at 35 (SD 5) mmHg. General anesthesia was maintained with sevoflurane delivered in 50% air and 50% O 2 . Patients were randomly divided into two groups: group A (caudal) patients were placed in the lateral decubitus position, and a single-dose caudal block by isobaric bupivacaine 0.25% (1.25 ml/kg) with a maximum volume of 20 ml was performed under sterile conditions using a 50 mm 23-G needle using a standard loss of resistance technique, and group B (TAP block) patients were placed in the supine position and TAP block was performed under ultrasound guidance. The linear ultrasound probe (high frequency probe 7-12 MHz) connected to a portable ultrasound unit [Sonoscape, Guangdong, China, (Mainland)] was placed in the mid-axillary plane in the transverse plane to the lateral abdominal wall midway between the lower costal margin and the highest point of iliac crest. A 50 mm VYGON needle attached with tubing system to a syringe filled with the local anesthetic solution was inserted in plane with the ultrasound probe and advanced until it reached the plane between the internal oblique and transversus abdominis muscles after careful aspiration to exclude vascular puncture; the local anesthetic solution of isobaric bupivacaine 0.25% (0.3 ml/kg) was injected, leading to separation between the internal oblique and the transversus abdominis muscles, which appeared as a hypoechoic space in ultasound. Skin incision was made 15 min after administration of caudal or TAP block . An increase in heart rate and mean arterial blood pressure (>20%) with skin incision compared with baseline values, 15 min after administration of caudal or TAP block analgesia was defined as failed blockade. One patient with failed caudal blockade was given fentanyl 1 μg/kg intravenously and was excluded from the study. Intraoperative hypotension requiring a fluid bolus and bradycardia requiring atropine were recorded. Perioperative blood loss was replaced using crystalloids and blood, as indicated. After completion of the surgical procedure, patients were awakened and extubated after reversal of muscle relaxant and transferred to the postanesthesia care unit. Using the pediatric observational FLACC pain scale score with its 0-10 score range [Table 1] , postoperative FLACC pain scale score was assessed by a blinded observer upon arrival in and at the time of discharge from the postanesthesia care unit, and then every 2 h for the first 24 h after operation. If two coupled observations separated by a 5 min waiting period yielded FLACC pain scale score at any time to be more than 3, oral acetaminophen 15 mg/kg/dose was administered as rescue analgesia to achieve FLACC scale score of 3 or less, with maximum oral daily dose of 75 mg/kg/day. Patients were observed for 20 min after oral acetaminophen; if FLACC pain scale score remained more than 3, rectal diclofenac 1 mg/kg/dose was given with maximum daily dose of 120 mg/day. The primary outcome measures were the time to first analgesia in minutes (from the time of caudal or TAP block injection to the first registration of FLACC pain scale score >3) and the analgesic doses (oral acetaminophen and rectal diclofenac) required during the first 24 h postoperatively. The secondary outcome measures included FLACC scale score and intraoperative hemodynamic variables. Data were analyzed using SPSS 17 (SPSS Inc., Chicago, Illinois, USA), version. Sample size calculation was based on a power of 0.9, at a probability of 0.05, and Cohen's d effect size of 0.8 or more to be a large effect size; 15 patients were assigned to each group accordingly to detect a difference in the average time to first analgesics , but more data were collected from extra patients. Normally distributed data were presented as mean and SD. Non-normally distributed data were presented as first quartile, median, and third quartile. The Student t-test was used to analyze normal distribution, whereas the nonparametric Mann-Whitney U-test was used otherwise. The current study included 40 infants and children scheduled for surgical pyeloplasty. One patient in group A (caudal) was excluded from the study because of failed caudal blockade. The remaining 39 patients were divided into group A (caudal n = 19) and group B (TAP n = 20). No significant differences existed between both groups with respect to patient characteristics and intraoperative clinical data [Table 2]. Using the pediatric observational FLACC pain scale score at different time intervals between both groups, FLACC pain scale score was significantly lower in group B than in group A at 2 h (P = 0.000), 4 h (P = 0.000), 6 h (P = 0.000), 8 h (P = 0.000), 10 h (P = 0.000), 12 h (P = 0.026), 16 h (P = 0.003), 18 h (P = 0.00), 20 h (P = 0.003), and 24 h (P = 0.000) postoperatively. However, both groups were comparable with respect to FLACC pain scale score upon arrival in postanesthesia care unit (P = 0.749), at the time of discharge from the postanesthesia care unit (P = 0.851), 14 h (P = 0.671) and 22 h (P = 0.798) postoperatively [Table 3]. Time to first analgesic requirement was significantly longer (P = 0.00) in group B than in group A (683 ± 173.9 vs. 287.63 ± 68.15 min), with a significant decrease in the total dose of postoperative oral acetaminophen (301.9 ± 161.26 vs. 635.05 ± 205.42 mg) (P = 0.00) and rectal diclofenac rescue analgesia (0, 0, 0 vs. 0, 0, 12.5 mg) (P = 0.039) [Table 4]. The current study revealed that ultrasound-guided TAP block provided significantly prolonged postoperative analgesia and reduced the postoperative analgesic requirements as compared with caudal block in pediatric patients undergoing open pyeloplasty. Open pyeloplasty is one of the most frequently performed surgical procedures in the pediatric population worldwide and is a cause of significant pain during the postoperative period . The optimal analgesic regimen should provide safe, effective analgesia reducing postoperative stress response and accelerating recovery from surgery . A multimodal analgesic technique is most likely used to achieve these goals; however, the optimal regimen remain to be elucidated . The TAP block provides excellent analgesic blockade to the skin, subcutaneous tissue, and musculature of the anterior abdominal wall . This muscular wall contains nerves supplying the anterior abdominal wall T6-L1, the ilioinguinal and iliohypogastric nerves, and the lateral cutaneous branches of the dorsal rami of L1-3 running in a neurovascular plane between the internal oblique and transversus abdominis muscles representing the 'target' of local anesthetic . Therefore, TAP block is used as a part of a multimodal approach after surgery involving the anterior abdominal wall ,. Moreover, the use of ultrasound-guided TAP block is an attractive method because of its simplicity and safety by targeting exactly the neural structures ,. In the current study, the duration of adequate analgesia (FLACC pain scale score <4) was significantly higher during the first 24 h after an ultrasound-guided TAP block compared with caudal block. The difference in pain scores was observed on the first postoperative day and this could be explained by the duration of the TAP block that extend up to 24 h.
Moreover, the current study demonstrated that NSAID and paracetamol requirements were decreased in patients who benefited from a TAP block. A more cephalad extension of sensory block with the ultrasound-guided TAP block also probably accounted for the lower postoperative FLACC scores at 2, 4, 6, 8, 10, 12, 16, 18, 20, and 24 h and lower analgesic requirements. In accordance with our study, several randomized controlled studies have confirmed that single-shot TAP block increases the time to first rescue analgesia for up to 48 h and decreases postoperative morphine consumption ,,. McDonnell et al. reported that TAP block given to 32 adults undergoing large bowel resection reduced the visual analog scale pain scores in the postanesthesia care unit (1 ± 1.4 vs. 6.6 ± 2.8) and at all postoperative time points, including at 24 h (1.7 ± 1.7 vs. 3.1 ± 1.5). Morphine consumption in the first 24 postoperative hours was also reduced (21.9 ± 8.9 vs. 80.4 ± 19.2 mg). TAP block with ropivacaine was found to cause effective postoperative analgesia and reduced postoperative total morphine requirements in the first 48 postoperative hours (66 ± 26 vs. 18 ± 14 mg) in 50 women undergoing elective cesarean delivery . Tanaka et al. demonstrated the effectiveness of TAP block in 64 pediatric patients aged 5-12 years receiving bone graft from the ilium to the alveolar cleft. In these patients, analgesia was effective with a significant reduction in postoperative analgesic rescue drugs (P < 0.05). In contrast, Fredrickson et al. demonstrated that, following pediatric inguinal surgery, ilioinguinal block was effective than ultrasound TAP block in which supplemental postoperative and intraoperative analgesics were necessary, which was explained by poor ultrasound image quality in the TAP block group. In contrast, Sahin et al. reported that ultrasound-guided TAP block provides prolonged postoperative analgesia (17 ± 6.8 vs. 4.7 ± 1.6 h) and reduced analgesic use in comparison with local wound infiltration in 57 children undergoing unilateral inguinal hernia repair. In the current study, FLACC pain scale was used, which has been validated for measuring postoperative pain in children and infant secondary to surgery, trauma, cancer, or other painful diseases, whereas previous studies have used the Children's Hospital of Eastern Ontario Pain Scale ,, the Children and Infants Postoperative Pain Scale , or the Objective Pain Scale  for assessment of postoperative analgesia in pediatric patients. However, most of these studies revealed no statistically significant difference in the postoperative observational pediatric pain score ,. 1. Penn HA, Gatti JM, Hoestje SM, DeMarco RT, Snyder CL, Murphy JP. Laparoscopic versus open pyeloplasty in children: preliminary report of a prospective randomized trial. J Urol 2010; 184:690-695. 2. De Beer DA, Thomas ML. Caudal additives in children-solutions or problems? Br J Anaesth 2003; 90:487-498. 3. Lloyd-Thomas AR. Pain management in paediatric patients. Br J Anaesth 1990; 64:85-104. 4. McDonnell JG, O′Donnell B, Curley G, Heffernam A, Power C, Laffey JG. 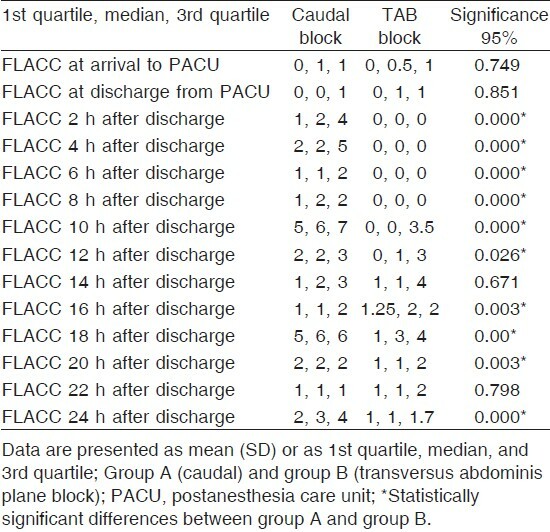 The analgesic efficacy of transversus abdominis plane block after abdominal surgery: a prospective randomized controlled trial. Anesth Analg 2007; 104:193-197. 5. McDonnell JG 1 , O′Donnell BD, Farrell T, Gough N, Tuite D, Power C, Laffey JG. Transversus abdominis plane block: a cadaveric and radiological evaluation. Reg Anesth Pain Med 2007; 32:399-404. 6. El-Dawlatly AA, Turkistani A, Kettner SC, et al. Ultrasound-guided transversus abdominis plane block: description of a new technique and comparison with conventional systemic analgesia during laparoscopic cholecystectomy. Br J Anaesth 2009; 102:763-767. 7. Carney J, McDonnell JG, Ochana A, Bhinder R, Laffey JG. The transversus abdominis plane block provides effective postoperative analgesia in patients undergoing total abdominal hysterectomy. Anesth Analg 2008; 107:2056-2060. 8. Chen CK, Phui VE. The efficacy of ultrasound-guided oblique subcostal transversus abdominis plane block in patients undergoingopen cholecystectomy. South Afr J Anaesth Analg 2011; 17:308-310. 9. Merkel SI, Voepel-Lewis T, Shayevitz JR, Malviya S. The FLACC: a behavioral scale for scoring postoperative pain in young children. Paediatr Nurs 1997; 23:293-297. 10. 1Zar JH. Biostatistical analysis. 4th ed. New Jersey: Prentice-Hall Inc.; 1999. 189-193. 11. 1A Bonnard, V Fouquet, E Carricaburu, Y Aigrain, A El-Ghoneim. Retroperitoneal laparoscopic versus open pyeloplasty in children. J Urol.2005; 173:1710-1713. 12. 1H Kehlet, M Werner, F Perkins. Balanced analgesia. Drugs 1999; 58:793-797. 13. 1Carney J, Finnerty O, Rauf J, Curley G, McDonnell JG, Laffey JG. Ipsilateral transversus abdominis plane block provides effective analgesia after appendectomy in children: a randomized controlled trial. Anesth Analg 2010; 111:998-1003. 14. 1Z Jankovic. Transversus abdominis plane block in (lower) abdominal surgery. Periodicum Biologorum 2009; 111:203-208. 15. 1Rozen WM, Tran TM, Ashton MW, Barrington MJ, Ivanusic JJ, Taylor GI. Refining the course of the thoracolumbar nerves: a new understanding of the innervation of the anterior abdominal wall. Clin Anat 2008; 21:325-333. 16. 1Niraj G, Kelkar A, Fox AJ. Application of the transversus abdominis plane (TAP) block in the intensive care unit. Anaesth Intensive Care 2009; 37:650-652. 17. 1Tran TM, Ivanusic JJ, Hebbard P, Barrington MJ. Determination of spread of injectate after ultrasound-guided transversus abdominis plane block: a cadaveric study. Br J Anaesth 2009; 102:123-174. 18. 1Mcnaught A, Shastri U, Carmichael N, Awad IT, Columb M, Cheung J, et al. Ultrasound reduces the minimum effective local anaesthetic volume compared with peripheral nerve stimulation for interscalene block. Br J Anaesth 2011; 106:124-130. 19. 1Mcdonnell JG, Curley G, Carney J, Benton A, Costello J, Maharaj CH, Laffey JG. The analgesic efficacy of transversus abdominis plane block after Caesarean delivery: a randomised controlled trial. Anesth Analg 2008; 06:186-191. 20. 2Mukhtar K, Singh S. Transversus abdominis plane block for laparoscopic surgery. Br J Anaesth 2009; 102:143-144. 21. 2McDonnell JG 1 , Curley G, Carney J, Benton A, Costello J, Maharaj CH, Laffey JG. The analgesic efficacy of transversus abdominis block after cesarean delivery. Anesth Analg 2008; 106:186-191. 22. 2Tanaka M, Mori N, Murakami W, Tanaka N, Oku K, Hiramatsu R, et al. The effect of transversus abdominis plane block for pediatric patients receiving bone graft to the alveolar cleft. Masui 2010; 59:1185-1189. 23. 2Fredrickson MJ, Paine C, Hamill J. Improved analgesia with the ilioinguinal block compared to the transverses abdominis plane block after pediatric inguinal surgery: a prospective randomized trial. Paediatr Anaesth 2010; 20:1022-1027. 24. 2Sahin L, Sahin M, Gul R, Saricicek V, Isikay N. Ultrasound-guided transversus abdominis plane block in children: a randomised comparison with wound infiltration. Eur J Anaesthesiol 2013; 30:409-414. 25. 2Manworren RCB, Hynan LS. Clincal validation of FLACC: preverbal patient pain scale. Pediatr Nurs 2003; 29:140-146. 26. 2McGrath PJ, Johnston G, Goodman JT. CHEOPS: a behavioral scale for rating postoperative pain in children. In: Fields HL, editor. Advances in pain research and therapy. New York: Raven; 1985. 395-402. 27. 2Buttner W, Finke W. Analysis of behavioural and physiological parameters for the assessment of postoperative analgesic demand in newborns, infants and young children: a comprehensive report on seven consecutive studies. Paediatr Anaesth 2000; 10:303-318. 28. 2Casey WF 1 , Rice LJ, Hannallah RS, Broadman L, Norden JM, Guzzetta P. A comparison between bupivacaine instillation versus ilioinguinal/iliohypogastric nerve block for postoperative analgesia following inguinal herniorrhaphy in children. Anesthesiology 1990; 72:637-639. 29. 2Ivani G 1 , De Negri P, Lonnqvist PA, L′Erario M, Mossetti V, Difilippo A, Rosso F. Caudal anesthesia for minor pediatric surgery: a prospective randomized comparison of ropivacaine 0.2% vs levobupivacaine 0.2%. Paediatr Anaesth 2005; 15:491-494. 30. 3Ivani G, Conio A, De Negri P, Eksborg S, Lönnqvist PA. Spinal versus peripheral effects of adjunct clonidine: comparison of the analgesic effect of a ropivacaine-clonidine mixture when administered as a caudal or ilioinguinal-iliohypogastric nerve blockade for inguinal surgery in children. Paediatr Anaesth 2002; 12:680-684.